No, they are not – the fit and aesthetics of crowns vary widely! This blog addresses the fit of the crowns, specifically how different types of fabrication (in-house vs. milled) affect their longevity. Part II will concentrate on how great aesthetics is achieved. There are a wide variety of crowns, extending from the most basic, milled crowns that are “stamped out” from a library of stock crowns in a software program, all the way to crowns that are custom fabricated by an in-house technician. As such, crowns can vary widely in their precision of fit, which, certainly, will dramatically affect how long they will last. 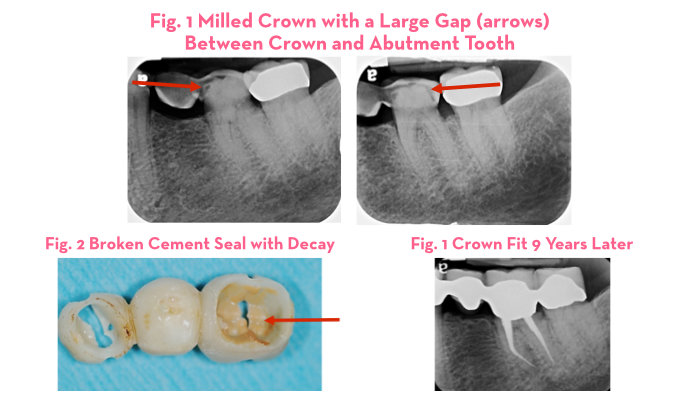 The fit of the milled crown will vary by the accuracy of the milling process and is usually not as good as the fit of crowns fabricated by a laboratory process, unless the CAD/CAM technician is held to very strict standards on creating that fit in the software (requires high skill). First, it is important to note that the average crown in America lasts only 7 – 10 years (insurance companies will reimburse you after 5 years), whereas with custom fabricated crowns such as the ones that are hand crafted by our in-house laboratory can last over 30 years (as ours do). While the custom crowns are, naturally, more expensive, you will achieve over a 300% return on your investment with custom fabricated crowns made in an in-house laboratory (10 years vs 30+ years). The above example is a milled bridge (from a software program) that lasted only two years because of a large gap between the tooth preparation and the crown (arrow, Fig 1). It had to be cut off, have the decay removed from the tooth, a root canal performed because the decay had extended into the nerve, and then a new bridge fabricated. 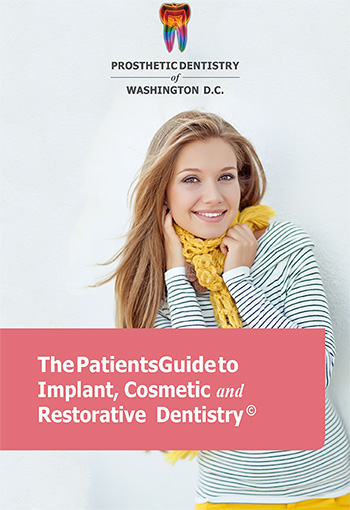 Stay tuned for Part II in this series to find out how we achieve great aesthetic outcomes on our custom-fabricated crowns.